My family loves chili. Chili with rice, chili dogs, chili with Frito’s corn chips, or Chili with Doritos chips — you name it, we love it. Lately, however, I’ve noticed that I get heartburn when I eat foods that contain too much tomatoes, and most chili recipes (mine included) are tomato-based. I created this recipe for two specific reasons. 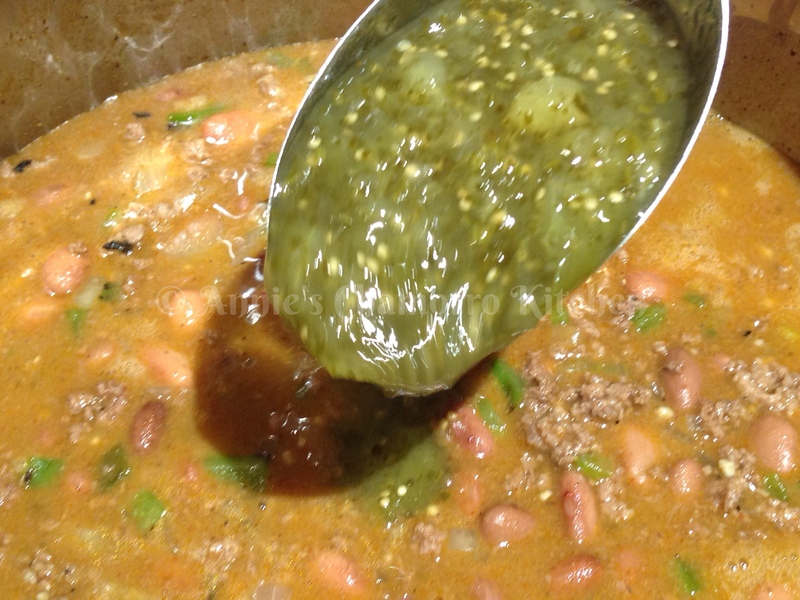 First, I wanted to create a tomato-less chili recipe to keep the heartburn at bay. Second, as you’ll read below, I wanted to create a healthier recipe that is right in line with my attempt at eating “cleaner”. You’ll see my basic recipe below, but scroll down a bit for some ingredient substitutions that make this a better choice when you feel like indulging in this, a typically UNhealthy (but oh-so-delicious) menu option. 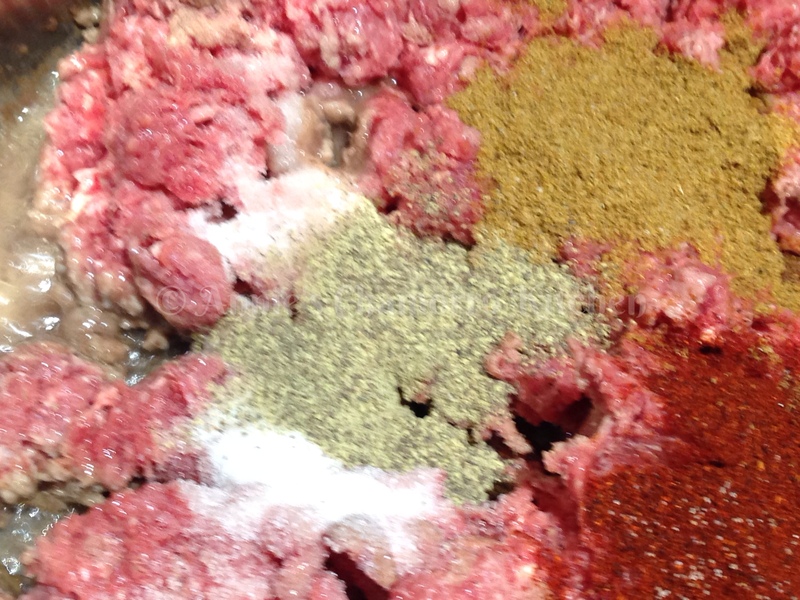 Note 1: Instead of ground beef, opt for ground turkey, or boneless, skinless chicken breast. Look for free-range chickens (and turkeys too, for that matter) if you can find it (read more about this below). 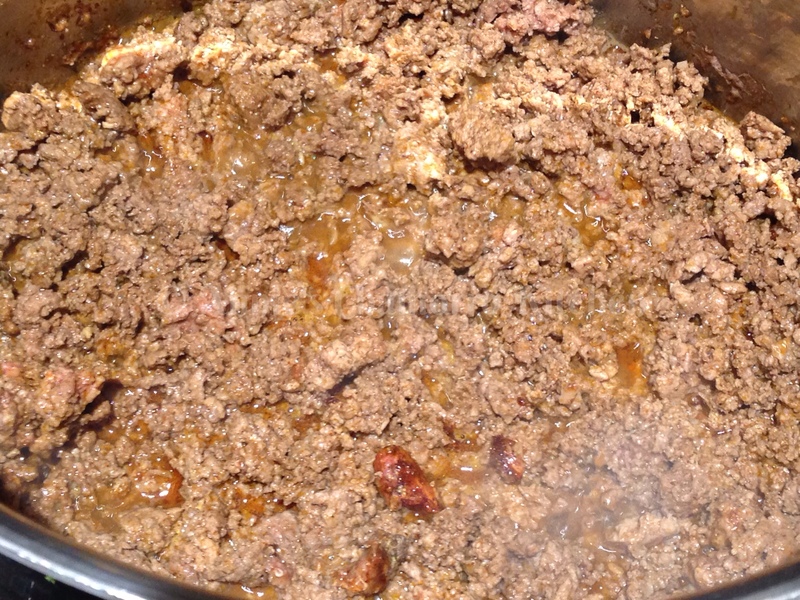 If you have a husband like mine who prefers ground beef chili, buy good quality beef that’s relatively low in fat. An even better choice is to buy grass-fed beef, if you can find any in your grocery store. Cows that are NOT grass-fed are typically fed a mixture of grains and animal byproducts. Now what cows do you know of that naturally feeds on animals? 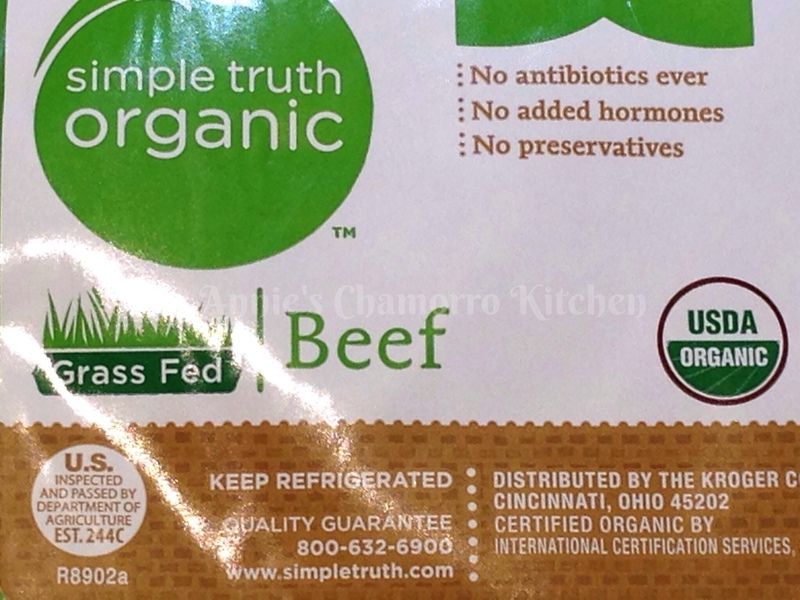 The photo below shows an example of a label for grass-fed beef. 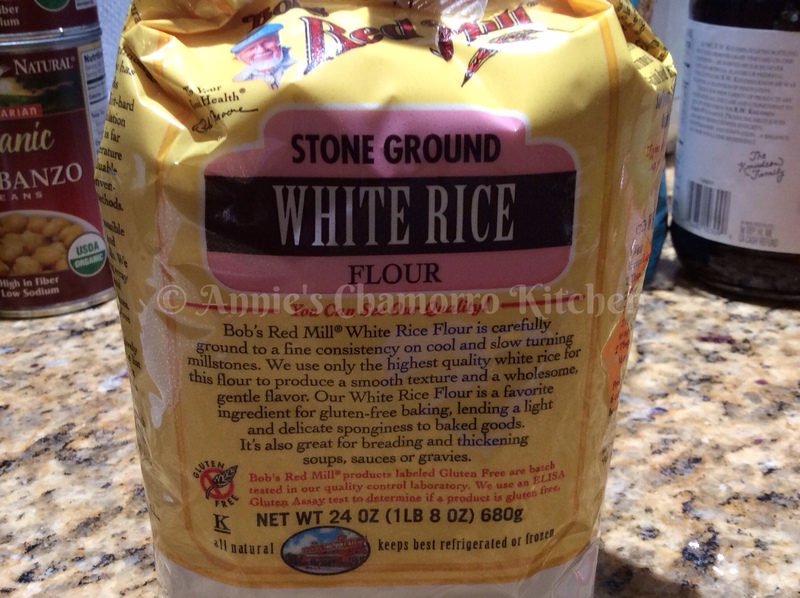 There is a stamp on the label that states it was inspected and passed by the USDA. You should also look for a USDA Organic stamp on the label. Most importantly, in addition to seeing “Grass Fed” on the label, you should also see that there are no antibiotics, hormones or preservatives in the meat. Note 2: I’m not gluten-intolerant, but for the next few weeks, I’m going gluten-free AND corn-free. If you recall my recipe for Beer Chili, I add crushed corn tortilla chips to serve as both a flavoring as well as a thickening agent. 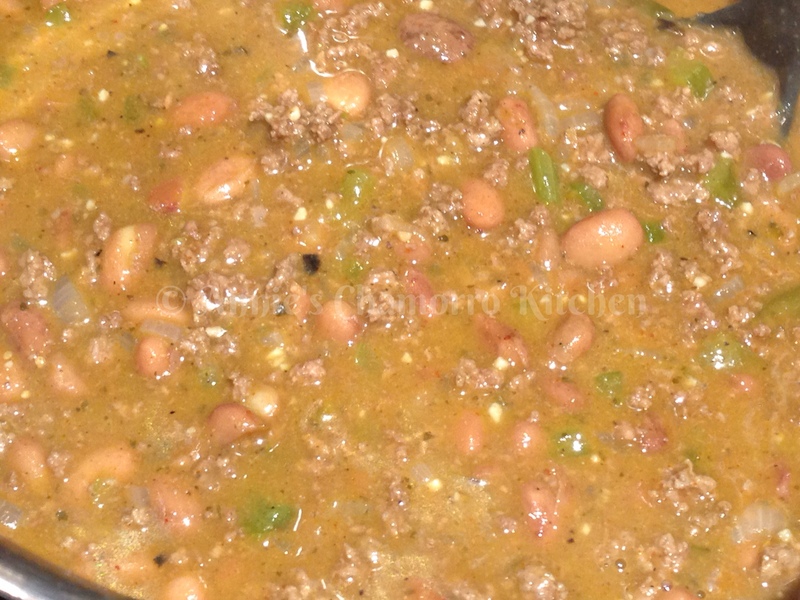 I had to figure out what type of non-wheat or non-corn flour would serve the purpose of thickening the chili without adding contrasting/offending flavors. This substitution nixes the all-purpose flour and tortilla chips and uses stone-ground rice flour instead. 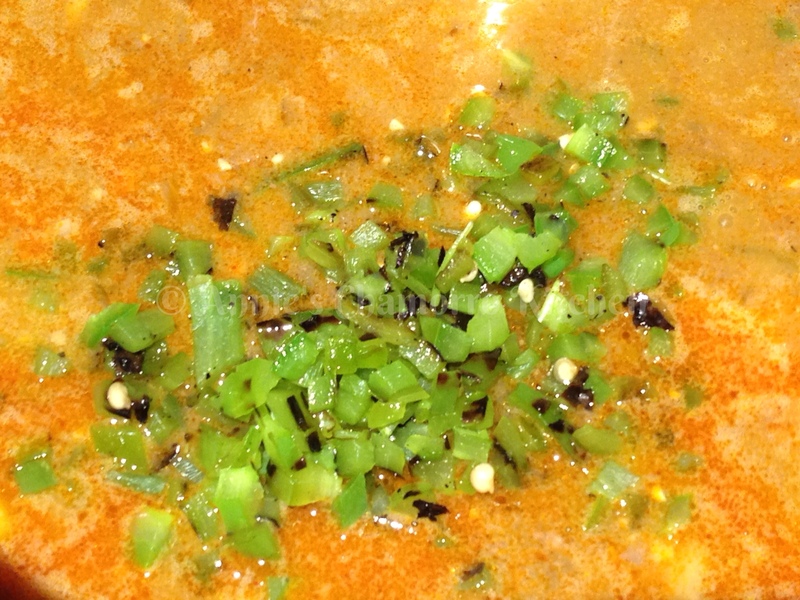 The rice flour thickens the chili nicely without masking the traditional chili flavors. Note 3: The best chicken stock in my view is homemade stock…if you have the time to make some, that is. I’m usually looking for time-savers in the kitchen, so I buy chicken stock most of the time. This substitution calls for organic chicken stock made from free-range chickens. Like grass-fed beef, free-range chickens are just that–chickens allowed to roam free and eat what they naturally eat, not a feed mixture that also usually contains animal byproducts, hormones and antibiotics. 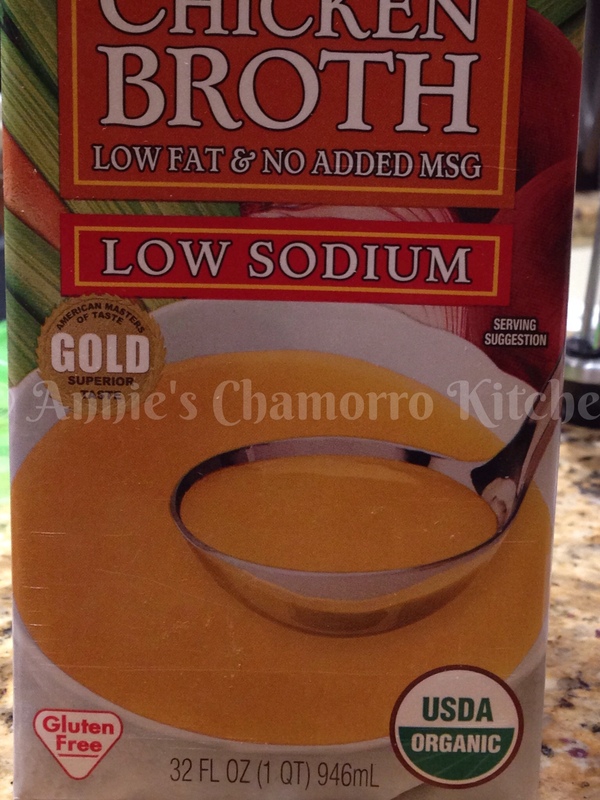 Look for broth that is low in sodium. You also want to see that USDA Ogranic stamp on the packaging. I’m a big fan of reading ingredient labels too. 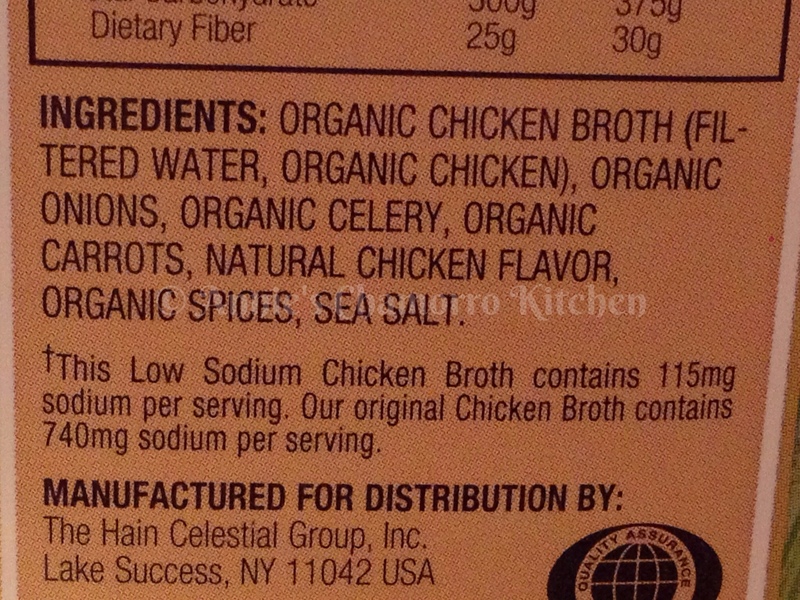 Not all organic and free-range broths are all that healthy. Most contain added sugar (to compensate for the decreased sodium). I’ve also found several brands that claim to be organic, but when you read the ingredient list, there is not one (or very few) ingredient that is organic! This is what you should see when you turn the box over and read the ingredient list. Organic…organic…organic…and no sugar added. 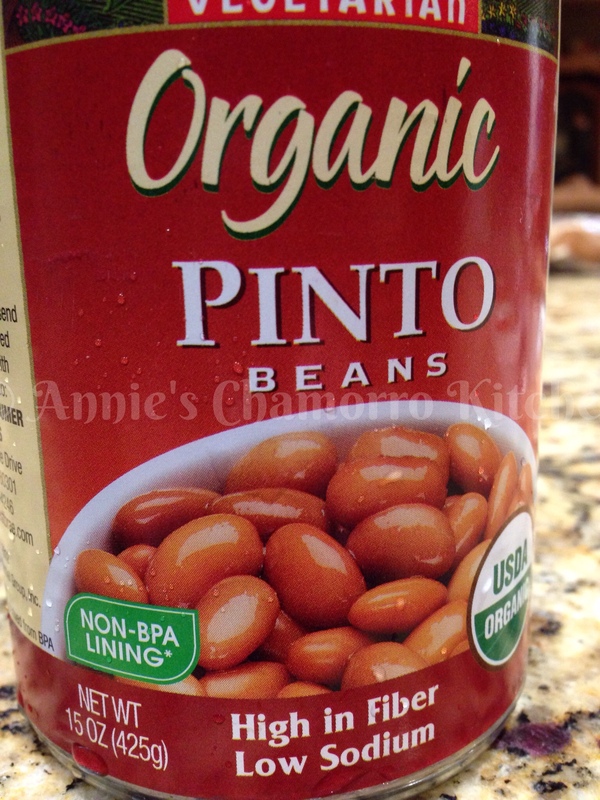 Note 4: Now there’s not much you can do to substitute pinto beans, aside from choosing to soak and cook dry beans or buying canned beans. Remember when I stated earlier that I’m all for saving time in the kitchen? Well, that means soaking and cooking dried beans are out–I buy canned beans all the time. The substitution I’m advocating for here is to look for cans that claim to have a Non-BPA lining. This photo shows what I’m talking about. BPA is the common acronym for the industrial chemical, bisphenol A, found in thousands of commercial products. BPA has been linked with reproductive problems, brain impairments, cancer, obesity and more. Eliminating exposure to BPA is probably not possible, but you can take measures to reduce your exposure. For example, rinse food (like canned beans) from cans before eating or cooking. Choose ceramic, glass or other microwave-friendly dishes, instead of plastic. Don’t use plastic containers with recycle codes 3 or 7 (look on the bottom of the container for the number) and look for (and don’t use) plastic bottles with scratches on them. Note 5: Adding sour cream is completely optional in this recipe. I do like the tang that you get by adding sour cream. To go (cow) dairy free, substitute with sheep’s milk plain yogurt, or omit the sour cream altogether. I hope I didn’t scare you off trying my recipe. It’s really delicious even if you DON’T make these substitutions, I promise! 1. Place a large pot over medium high heat. 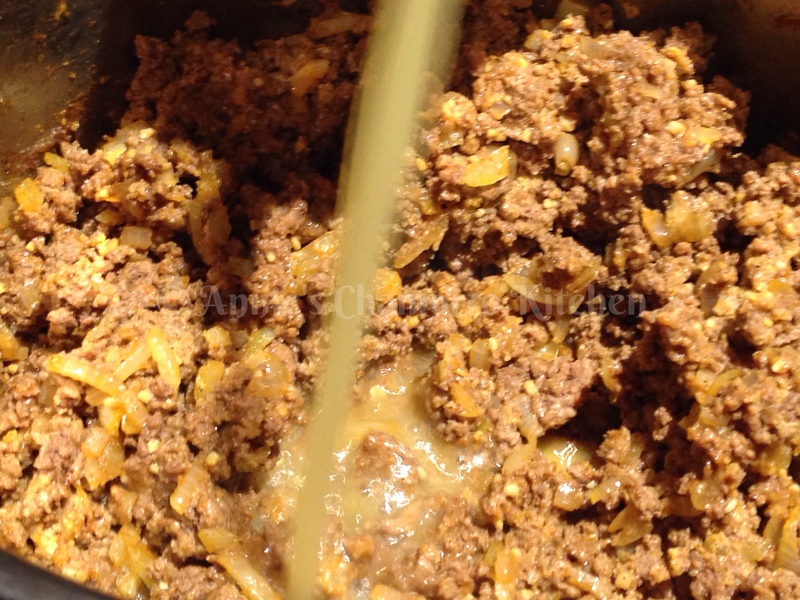 Add the ground beef (or ground turkey or chicken pieces). 2. Add the cumin, chili powder, oregano, sea salt and black pepper to the pot. 3. 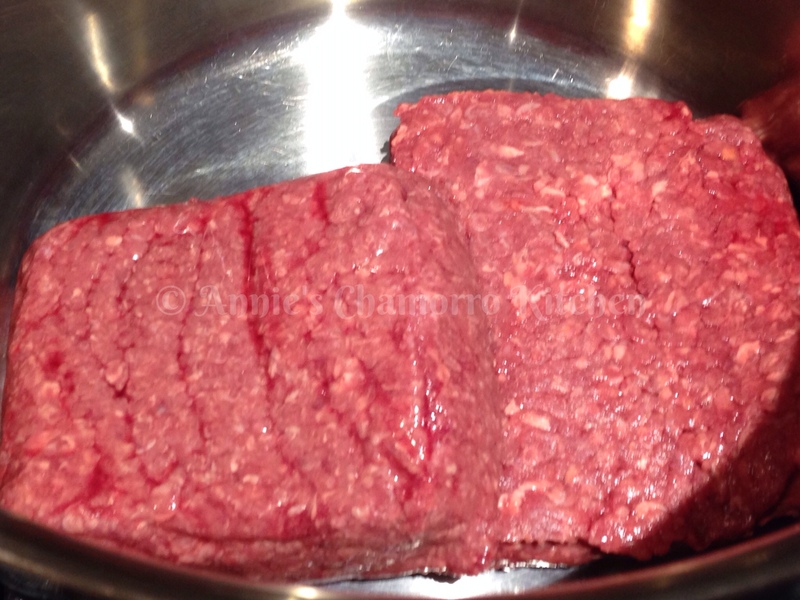 Stir well; cook until the meat is browned. 4. 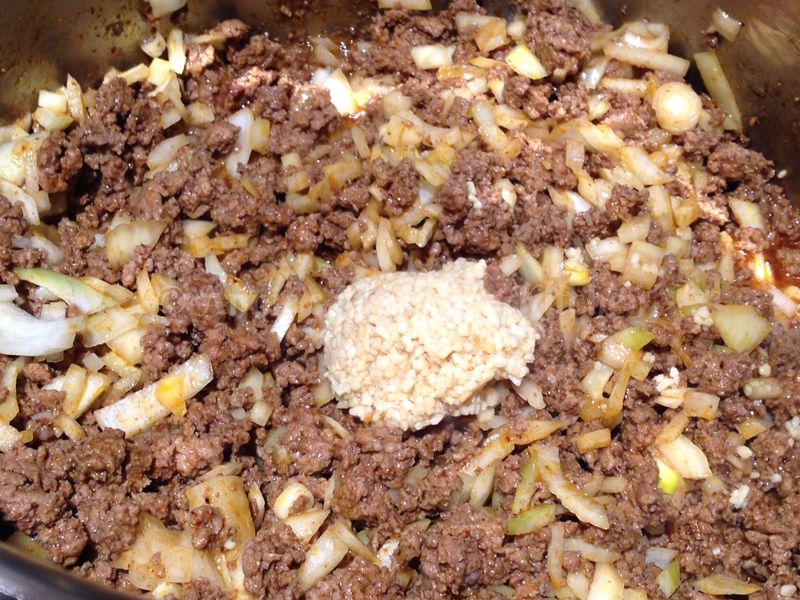 Add the onions to the pot; stir to combine the ingredients. 5. Cook until the onions are translucent. Add the garlic to the pot; stir to combine the ingredients. Cook for about a minute. 6. Add the flour to the pot. 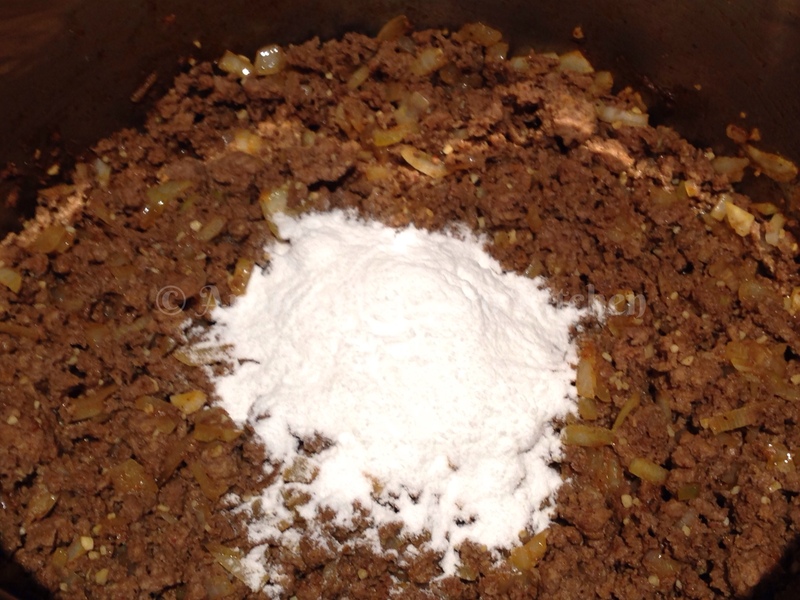 Stir to thoroughly mix the flour into the meat mixture. 7. Pour the chicken stock into the pot, stirring the mixture as you add the liquid. Turn the heat up to high. Continue cooking, stirring occasionally. The mixture will thicken as it cooks. 8. 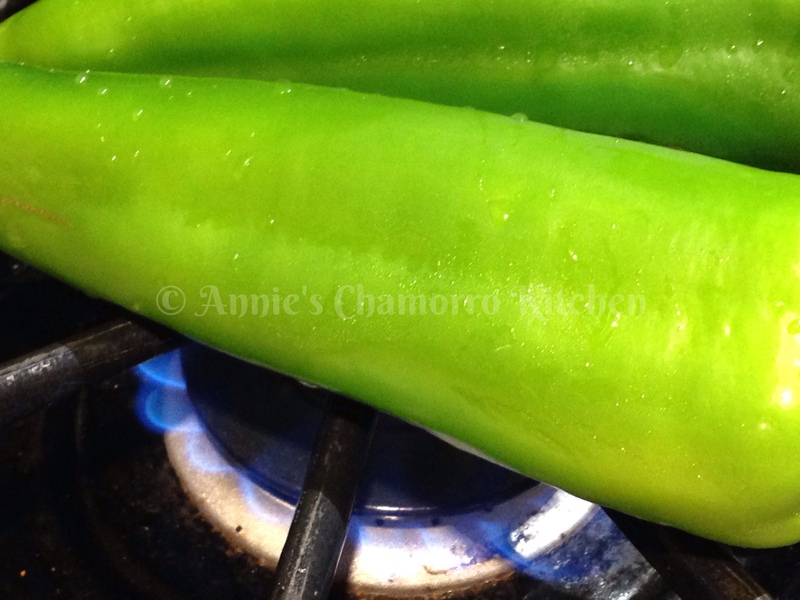 While the chili is cooking, roast the poblano chilies. I just place the peppers over one of the burners on my gas stove. 9. Rotate the pepper as it grills to ensure even cooking. 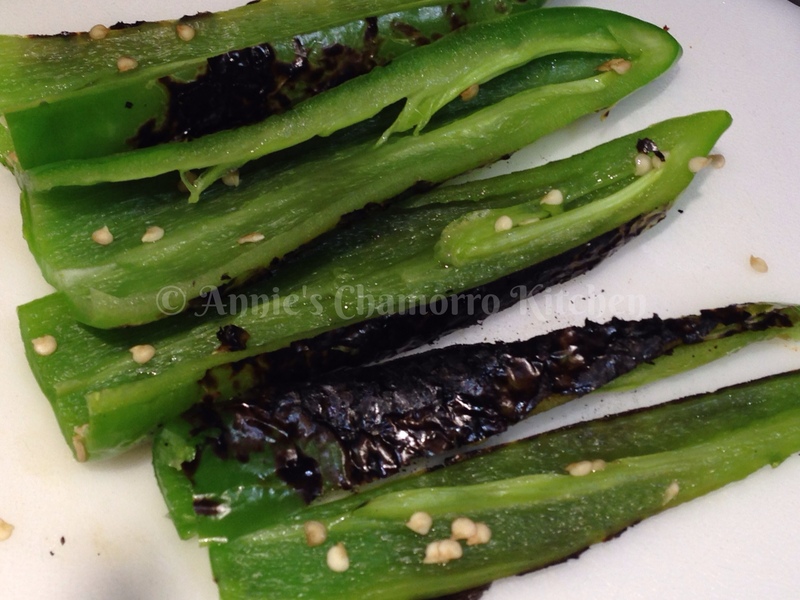 To remove the charred skin, let the peppers cool slightly. 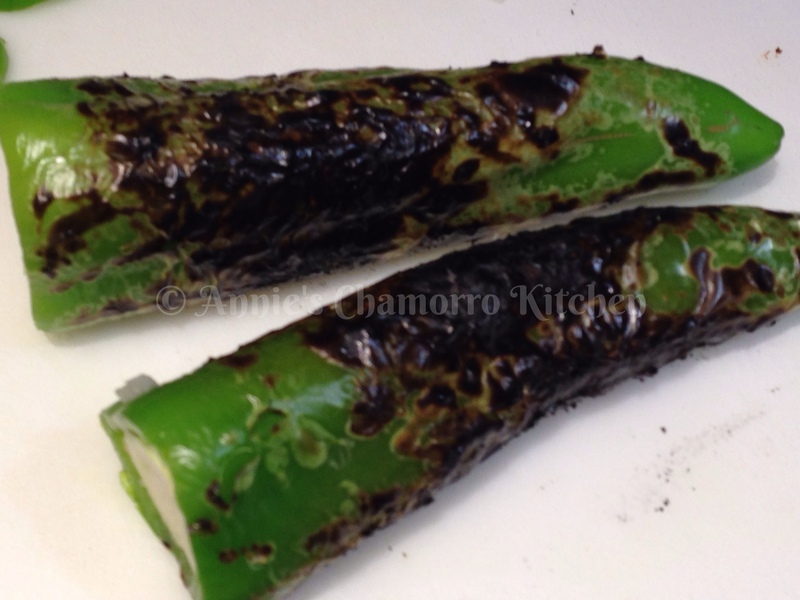 After the peppers cool, use a damp paper towel to rub the charred skin off the peppers. 10. Cut the peppers in strips, lengthwise, then dice them into small pieces. 11. Add the peppers to the pot. If you want to add the optional chipotle peppers and chipotle Tabasco, add them to the pot now. 12. 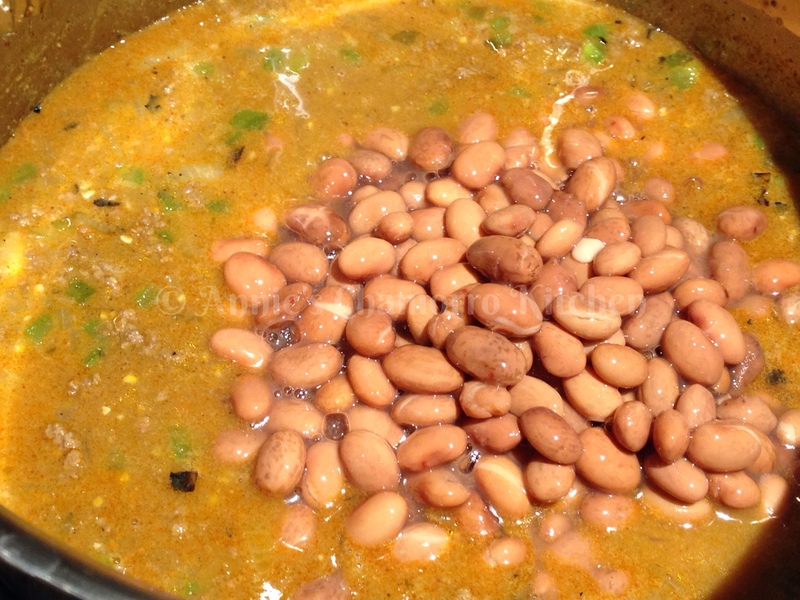 Add the drained and rinsed beans to the pot. 13. 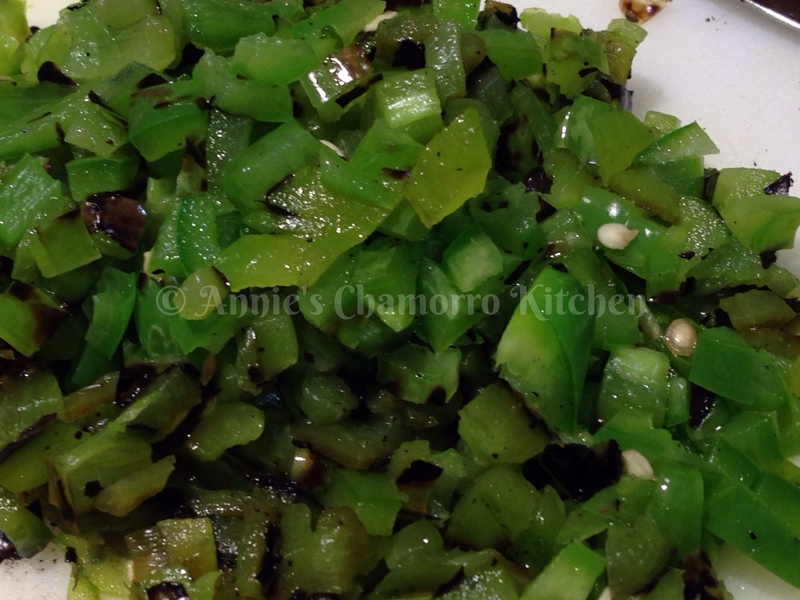 Stir in the tomatillo salsa. Note: I bought a jar of organic tomatillo salsa for this recipe, but you can make your own from scratch. 14. Place a lid on the pot. Reduce the heat to medium. Cook for about 5 more minutes. 15. The chili should be nice and thick by now. Stir in the optional sour cream (note that I did NOT add any sour cream to the chile pictured in this recipe). Give it a taste and adjust the seasonings and salt to your liking. Serve with rice (I opted for brown rice) or chips and ENJOY! I have to try this recipe, my daughter, grandkids and roommate are all affected by tomatoes. No tomato chili, yet you have tomatillos. Aren:t tomatillos part of the tomato family? I am really allergic to tomatoes and was told they are part of the tomato family. Just asking? Tomatillos and tomatoes are in the same family (nightshade), but tomatillos are the fruit of a different plant, and are not tomatoes. Thank you for this recipe! My family loved this and told me to save this recipe for another meal. What is the heat level on this chili? Wife doesn’t like anything spicy. It’s not too spicy at all. You could always omit or cut back on the amount of chilies or chipotle peppers you add. I like it spicy, so I add the optional chipotles in adobo sauce and jalapenos. I don’t think it would be spicy without it. Yum! I like mine spicy too. I’ve made this many times. Your recipe is delicious! Thank you for sharing! This looks delicious. I too can’t eat tomatoes, and I my husband love chili. Just curious, I sometimes have issues with garlic, is there any substitutions out there for it in this recipe? I look forward making it. You can just omit the garlic. We usually have issues with real onion and garlic so we use onion and garlic powder. I was wondering why you use chicken stock and not beef? I like chicken stock…no other reason. I like chicken stock too!!!! Yum! This was awesome! I literally had everything in my kitchen except the pobalnos so I used jalapenos. Your directions were so clear and easy to understand. Thank you! You can use plain water and a couple of bouillon cubes. We need to cut tomatoes out of our diet, so I tried this, only i broiled whole tomatillos first to make my green salsa. This had a great flavor when it all melded. I make competition chili and this one is going to the test next time for sure! I’m sure whatever you come up with will be fine. Let me know how it turns out. I made this last night for a family gathering. Everyone loved it! It sounds delicious, and I’m going to try it. How about adding a print-friendly button to your recipe pages? Thanks, Martha. As for printing, I already do have a print-friendly capability. Click on the printer icon. When the next window opens, you can choose to save the file a as a pdf or print without images. I’ve got to let you know that my wife and I loooooove this recipe. 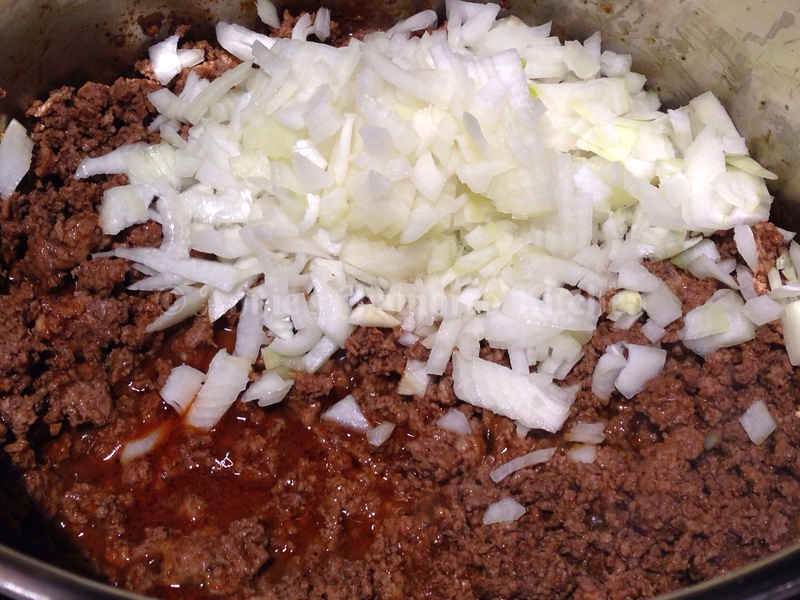 She tries to stay away from tomatoes for health reasons, so this recipe works great for her and it fills my carnal instincts for tasty, meaty chili. We’ve added brown rice the last couple of times though since we were having issues with thickness of the chili early on. So the rice adds a bit more “filling” to it. But it was super delicious before that, too. Hi Brandon! I’m so glad both you and your wife like my recipe! Great idea about adding rice as it cooks. 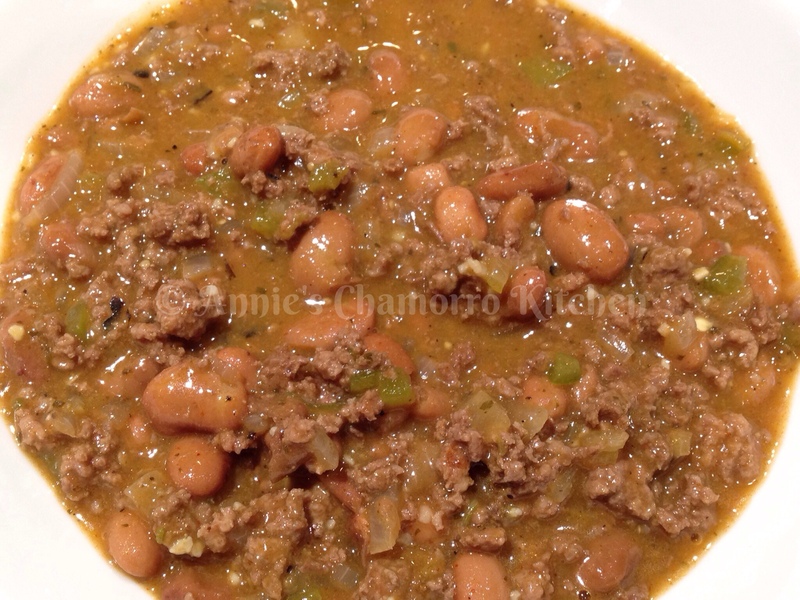 This recipe looks just like my mom’s chili beans!! I thought the recipe was lost when we lost her. Thank you!!! Let me know if it comes close to your mom’s. 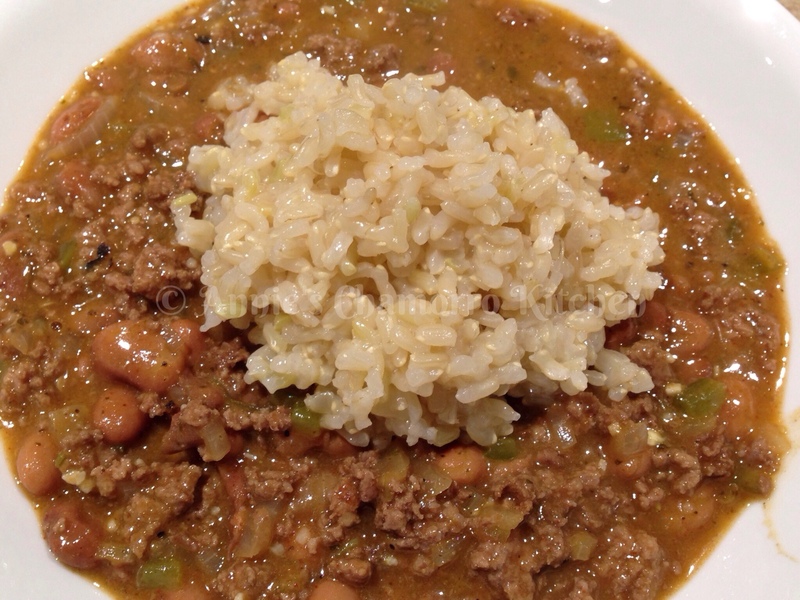 Made this ono chili and the family loved it! Your a great cook! Thanks for sharing.